picture #14654 showed Mr Jarvie the school master at Pierowall. I believe he had seven daughters and this is a picture I found marked "the Jarvies". My grandfather was the schoolmaster at the Westside School in Westray and would have known Mr Jarvie. In fact they were the Captain and Treasurer of the Westray Golf Club at that time. My grandmother Alice Winter (nee Jarvie). Alice is on the far right of the photo. Alice married my grandfather, Harry Winter, an Australian solder serving in World War One. After Harry was demobbed after the war, he studied and exhibited paintings at the Royal College of Art in London, where Alice was working at the time. They fell in love and Alice moved to Adelaide, Australia as Harry's wife. Alice and Harry had five children together. Donald (my father), Frank, Bob, Alfred and Jean. 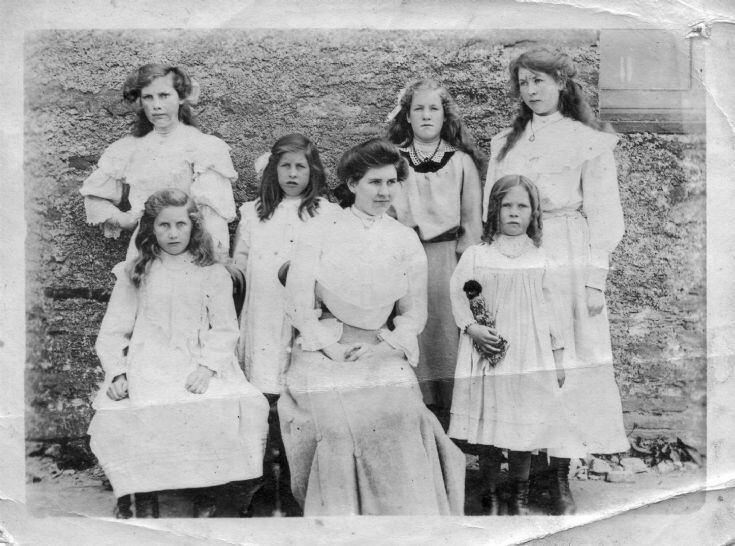 My grandmother, Jessie Jarvie (Mrs. Jock Tait) is seated at the left next to Lydia also seated. Back row: Margaret (Meg), Ruby, Dorothy, Alice (my mother was named after her). Standing at the front right is the youngest,Jean,who also emigrated to NZ. I think Ruby ended up in Australia too. Their father Robert was a Glaswegian who went first to Sanday to teach and married a local lass, Lydia Ann Miller. All the girls were born there and my granny often recalled the awful trip to Westray when Mr. Jarvie moved schools. He eventually retired early to Stenness on the mainland due to failing eyesight and became the registrar and a lay-preacher. I have been in touch recently with Lisa Winter, Alfred's daughter, from Australia and passed on some more info and pictures of gravestones in Orkney. Mr and Mrs Robert Jarvie, his brother John, and the remaining 4 daughters and their spouses are all buried in Stenness kirkyard. My parents (Alice Jarvie Tait and James Patience) got married in the church in 1958 but due to my dad's job as a banker, I was brought up in Caithness and Aberdeenshire on the Scottish mainland. My copy of this photo is not in such a good condition as it was probably in the sunlight. Thanks to Bill for posting it! For all I know, his family may well be in the photo box that I've inherited! Hello to Sandra in Australia!Please get in touch if you want to know more details.